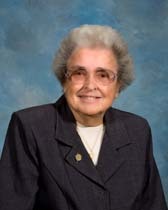 Sister Mary Steffe died at Abington Lansdale Hospital on December 12, 2018 and was buried on December 19, 2018, at Saint Joseph Villa. Mary’s life began on October 20, 1930, or as she often referred to it, “10-20-30.” Alphonse and Margaret Steffe raised their four children in St. Joachim’s Parish, and after graduating from elementary school, Mary attended Little Flower High School. On September 12, 1950, Mary entered the Sisters of Saint Joseph and, upon professing her vows, took the name Sister Margaret Alphonse. Most of Mary’s 68 years as a Sister of Saint Joseph were spent in education, first on the elementary level then for more than 25 years in high school. After working in the class room of many archdioceses including Philadelphia, Baltimore, and the diocese of Harrisburg, Mary became a school administrator in the Activities Office at West Catholic Girls’ High School and eventually Roman Catholic High School. In the later assignment, Mary worked with a dedicated , committed, and lively team. Among other projects, she did a wonderful job with the Mother’s Club and was proud of her achievements. Mary’s capacity to love spilled out to her God, her family, especially her dear sister Kathryn, and her many nephews, nieces, grand nephews, grand nephews were counted among her most valued relationships. Her love of family was evident in her many stories she told and how proud she was of their lives and accomplishments. Likewise, Mary’s family cherished her and her deep friendship with Sr. Francis Paula, or “Aunt Francis” as they often called her. Again Mary’s capacity to love included her sisters in the community, the shore- especially Forked River, holidays, vacations, cooking, drinking, eating, dancing, and so much more. In many local communities, Mary’s sense of humor, her compassionate and supportive nature made her vital part of the fabric. One of the sisters’ most vivid memory of Mary was her love of sweets. Although a diabetic, Mary would often be seen haunting the candy dish. Perhaps her upbeat and positive personality was connected to her love of all things sugary. As Mary enters Paradise, her parents, brother, George, friend, Sr. Francis Paula, and so many family members and friends await her arrival. In our Congregation we believe that “by the integrity of our prayerful reflection… we become by God’s grace the Congregation of great love of God, so wherever we are and whatever we do, our lives may proclaim the love we profess.” These words express the life of S. Mary Steffe; therefore, we ask Mary to intercede for us that we are open to the blessings that life continues to offer us. Keep dancing, Mary, and enjoy the music of the spheres.